Buick LeCrosse, LeSabre, Enclave, Lucerne, Regal, Rendezvous, Terraza, Century, Park Avenue, Rainier, GL8. 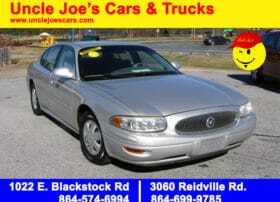 Used cars, used vans, used SUVs, used sports cars, used luxury cars, Buick used cars. 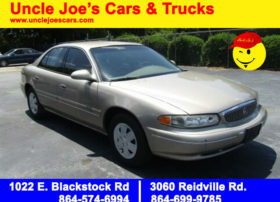 Uncle Joe’s Cars and Trucks buy here pay here can help you buy a car with bad credit or no credit. If you are looking for used cars in Spartanburg, used cars Moore, or used trucks in Duncan or Roebuck are, then see us for approved bad credit financing and quick approval.